The beginning of March kicks off National MS Awareness Week and National MS Education & Awareness Month. During this time, we here at 180 Medical wish not only to honor and support those who are affected by MS but also to share some important educational information, tips, and resources. MS stands for Multiple Sclerosis. And what is that, exactly? Well, the truth is that a lot about MS remains a mystery. No specific cause has been nailed down, and as of now, there is no cure. What we do know is that Multiple Sclerosis is an immune-mediated “chronic, often disabling disease that attacks the central nervous system (CNS), which is made up of the brain, spinal cord, and optic nerves” (Source: National MS Society). 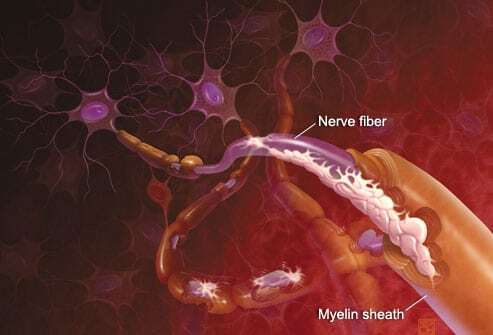 MS specifically attacks the myelin sheath, which is the fatty material that wraps and protects nerve axons in order to transmit impulses in the body. For a comprehensive list of symptoms, visit National MS Society’s symptoms page. With about 2,500,000 people around the world who have MS, there’s a good chance you know someone who is currently living with MS. In fact, MS is the most common disease of the central nervous system among young adults, and the first diagnosis usually occurs between 20 and 40 years of age. While it’s not known to significantly affect the length of one’s life, many can attest to how it affects the quality of life. That’s why it’s so important that we all become aware and support research on this disease so that more can be learned, and a cure can someday be found. What is one way you connect daily with hundreds of your friends, family, and co-workers? Social Media! Consider changing your social media profile picture (Facebook, Google +, Pinterest, Twitter, etc.) to something MS-related. Or you can share an educational status update or a YouTube video with your followers. Think up a fun way to promote the color orange (color for MS Awareness), such as suggesting that you and your co-workers/employees or family wear orange one day during MS Awareness Week. Put together a fundraising bake sale for an MS organization at your place of work or school, or you could even coordinate the event with a local business. You could sell orange cakes, orange iced cookies, cupcakes, etc. Register and participate in an MS Society fundraiser event. 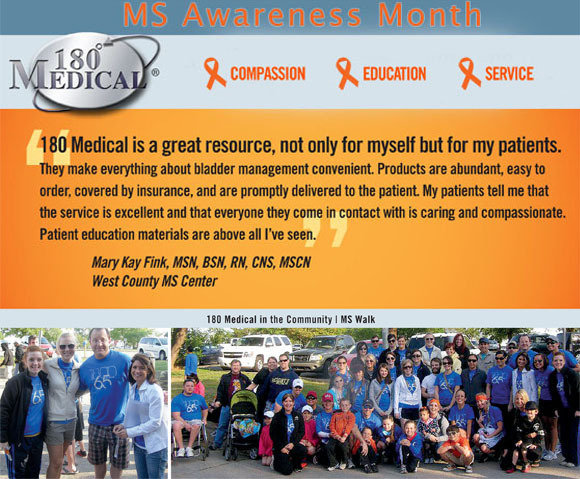 We here at 180 Medical always love being a part of our local MS Walk each year! Visit the links below for more information on MS, to find support and help, and to connect with the online MS community or locally. March is MS Awareness Month. Here are a few things to know and share about this condition. March is MS Education & Awareness Month, and MS is the most common disease of the central nervous system. Learn more about this condition and how you can help raise awareness in your own community. 180 Medical participated in the 2013 MS Walk in Oklahoma City.